Students in the Honors Program may have the opportunity to join local chapters of Alpha Lambda Delta and Golden Key. Entrance into these honors societies are by invitation only. However, because students in the Honors Program excel academically, many are asked to participate in these honors societies. For more information about the admittance requirements and learning opportunities associated with Alpha Lambda Delta and Golden Key, please following the links below. Alpha Lambda Delta (ALD) is an honor society for students who have maintained a 3.5 or higher GPA and are in the top 20 percent of their class during their first year at Fredonia. The purpose of ALD is to encourage superior academic achievement, to promote intelligent living and a continued high standard of learning, and to assist students in recognizing and developing meaningful goals for their roles in society. 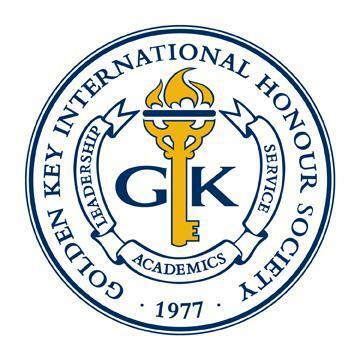 Golden Key is the world's premier collegiate honor society, recognizing outstanding academic achievement and connecting high-achieving individuals locally, regionally & globally with lifetime opportunity, reward & success. Membership is by invitation only and applies to the top 15 percent of university sophomores, juniors and seniors, as well as top-performing graduate students in all fields of study, based solely on their academic achievements. Alma Mater Society. An honorary organization of students selected annually by the student body at Fredonia. The society was established in 1966 by the Student Association for the purpose of recognizing those students, faculty and staff who have exhibited outstanding qualities of character and leadership in support of the student body and the campus community as a whole during their university years. Tau Sigma. Tau Sigma is a national honor society designed specifically to recognize and promote the academic excellence and involvement of transfer students. A minimum 3.50 grade point average at Fredonia is required for membership. Alpha Epsilon Rho(AERho). The National Broadcasting Society. An honors organization comprised of student and professional broadcasters whose primary goal is to bridge the gap between the academic and professional worlds of broadcasting in order to better prepare students to enter the broadcasting industry. Student national members must have a GPA of 3.0 in communication courses. Local membership requires a 2.5 GPA in communication courses. Alpha Kappa Delta. Sociology majors and minors who maintain a minimum 3.0 grade point average in their major or minor and overall are eligible for induction into Alpha Kappa Delta, the International Sociology Honorary Society. Alpha Lambda Delta. A national honor society recognizing first year students who have maintained a 3.5 or higher GPA and are in the top 20 percent of their class during their first year of higher education. Alpha Lambda Deltawas re-chartered at Fredonia in 2006. Alpha Psi Omega. A national dramatic society for students in theatre arts at the junior or senior level who have attained an overall grade point average of 3.25 in their major and who contribute significantly to the theatre program. Beta Beta Beta. A national honor society recognizing superior scholarship and research in the biological sciences. TheUpsilon Chi chapter of Beta Beta Betawas installed at Fredonia in 1966. Chi Alpha Epsilon. A national honor society recognizing continued academic achievement of students admitted to colleges and universities through non-traditional criteria, developmental or Higher Education Opportunity-type programs. Students must be full-time and have a 3.0 GPA for two consecutive semesters. The Alpha Muchapter was established at Fredonia in September 1999. Delta Mu Delta. A national honor society in business administration. Financial Management Association National Honor Society. Established in 1976, the membership is composed of outstanding students in the field of business finance. Kappa Delta Pi. A national honor society in education. The local chapter is Zeta Upsilon. Membership is by invitation. Omicron Delta Epsilon. A national academic honor society granting recognition in the field of economics. Tauchapter was installed at Fredonia in 1971. Phi Alpha Theta. An international honor society in history whose membership is composed of students and professors and whose purpose is to recognize, through its membership, excellence in the study of history. Membership is open to any student who has completed 12 or more credit hours of history and who has achieved prescribed standards of academic proficiency. Phi Mu Alpha Sinfonia. Rho Chi chapter ofPhi Mu Alpha SinfoniaFraternity of America was installed at Fredonia in May 1966. As a national professional music fraternity for men, Sinfonia endeavors to advance the cause of music in America and to foster the mutual welfare and brotherhood of students of music. Pi Delta Phi. A national French honor society whose local chapter, Epsilon Rho, was installed in May 1968. The society recognizes outstanding scholarship in French and strives to stimulate cultural activities that will lead to deeper appreciation of France and its people. Members are nominated in recognition of academic achievement. Pi Kappa Lambda. A national music honor society, first organized in 1918. The society’s primary objective is “the recognition and encouragement of the highest level of musical achievement and academic scholarship.” Initiates are elected by the society’s membership on the basis of this objective. Fredonia’s chapter ofPi Kappa Lambda isDelta Omega. Pi Mu Epsilon. A national honorary society for the promotion of scholarly activity in mathematics among students in academic institutions. Members are elected on an honorary basis according to their proficiency in mathematics. Pi Sigma Alpha. The political science department is a member ofPi Sigma Alpha, the national political honor society. Outstanding undergraduates majoring in Political Science are admitted to membership. Psi Chi. A national honor society in psychology. This organization recognizes academic achievement of students with majors or minors in Psychology. The purpose is to advance the science of psychology and to encourage scholarship among members. Sigma Alpha Iota. Incorporated as a woman’s international music fraternity whose purposes are to foster interest in music and to promote social contact among persons sharing a general interest in that art form. Delta Lambda chapter was installed at Fredonia in 1964. Sigma Delta Pi. National Spanish honor society whose local chapter,Eta Alpha, was installed in May 1968. The society promotes the understanding and appreciation of Hispanic culture. Members are selected from advanced students who exhibit outstanding ability and interest in Spanish studies. Sigma iota Rho.The purpose of this organization is to promote and reward scholarship and service among students and practitioners of International Studies, International Affairs, and Global Studies and to foster integrity and creative performance in the conduct of world affairs. Sigma Pi Sigma. A national honor society, the sole purpose of which is to recognize excellence in the study of physics coupled with high overall academic scholarship. Membership is open to qualified first-semester juniors, seniors, graduate students, and faculty. The Fredonia chapter was installed in May 1970 as a subdivision of the existing chapter of the Society of Physics Students, a national organization open to all persons with active interest in physics. Sigma Tau Delta. The International English Honor Society. Undergraduate and graduate students in English and English Adolescence Education maintaining advanced academic standing and interest in the profession are eligible for induction to the Alpha Xi Omicronchapter. Founded in 1924, the society "confers distinction for high achievement in English language and literature; provides cultural stimulation and promotes interest in literature and the English language; fosters all aspects of the discipline of English, including literature, language and writing; promotes exemplary character and good fellowship among its members, exhibits high standards of academic excellence, and serves society by fostering literacy." Fredonia's charter was granted in 2006. Sigma Xi. National organization for the promotion of scientific research. It has an active club at Fredonia with membership open to both faculty and students who have done publishable work.